By Hank Boerner of the Governance and Accountability, Inc.
“The” voice of authority for many board members and C-suite executives is The Harvard Business Review. Sustainability pioneer and influential thought leader John Elkington in the current “HBR” talks about the practice of “issues framing” at the highest levels of the corporation, and suggests (to leaders) that to change our usual way of perceiving, prioritizing and investing time/effort/money, that “re-framing” for social change is the wave of the future. Note that social commentator and author George Lakoff (writing in “How to Think Like An Elephant”) suggested the theme of re-framing our reasoning and setting of priorities. The HRB piece builds on that and takes us to the new frontier for corporate strategy-setting. John Elkington writing in HBR sees six mainframes at work in the sustainable business space, each with strengths and limitations. These are: (1) the Resources Frame; (2) the Time Frame; (3) the Value Frame; (4) the Design Frame; (5) the Abundance Frame; (6) the Moral Frame. Each is described with current and historical examples, and the strengths and challenges posed as we consider the frame. The “break” needed, Elkington advises, is from set-in-your-ways thinking and planning and strategizing on critical issues — such as global warming — to new ways of Framing. Greater understanding of the different mental and political “framing” currently in play is important in considering the shift. And so, a first step is to consideration of resources and population growth and the pressure on available resources and the resilience of key eco-systems. (The Resource Framing). Then from this to the Timing Frame. Elkington’s suggestion is to shift from short-term to longer-term planning and strategizing and to focus on the Sustainable Development Goals with time their widely-adopted time horizon out to 2030. And then on the other four Framings, which we recommend for your reading and thinking about. As we noted up top, the HBR is really an influence in corporate boardrooms and C-Suite — think about the powerful impact of the “Shared Value” concept introduced by Professor Michael Porter in the HBR pages a few years ago. Companies in the sustainability space face a common challenge: how do they sell their products or services? Convincing customers to buy something for purely environmental or sustainability reasons can still be rather difficult. Products or services which are meeting an existing need of customers, with the additional benefit of being sustainable, is somewhat easier. If a customer has a choice between two similar products, one being sustainable, the other not, many will choose the more sustainable product, even at a slightly higher price, as it seems like the right thing to do. What, then, of products or services which do not necessarily meet an existing need, but are better for our planet? Take, for instance, the real estate and construction industry. I work for an energy efficiency company, which provides a suite of services to real estate companies, with the goal of reducing energy and water use in multifamily residential buildings. We have many clients who are interested in reducing energy and water use, primarily to save money on their utility bills and decrease operating costs. Clients appreciate the added benefit of being more sustainable, and reducing carbon emissions, but it is not always the main reason they want to work with us. I’m sure that this problem is not unique to the real estate industry. So, how to convince consumers and companies to opt for more sustainable products, services and supply chains, when the immediate benefit is not tangible or obvious? How do we tell customers they need these services? There are several options, of course: educating our customers, advocating for laws and regulations which require more sustainable choices, investors asking for greater disclosure on sustainability efforts. These are all good options, and should be pursued. However, in my view, we (I am referring to the collective we, not my particular company) need to start telling stories. I like this article which discusses how telling stories can help us make sense of climate change, a notoriously difficult topic to grasp on an emotional level. Stories give us something we can relate to in our own experience. We can apply this idea to any company who is looking to sell its services in the sustainability space. I’ll use the energy and water efficiency company as an example. An upgrade to a building will make it more energy efficient, save on utility bills, and reduce carbon emissions. Those all sound like good things – but what if we think of it on a more personal, individual level? Why don’t we tell more stories of individual residents who are now more comfortable in their apartments? Or of elderly residents who were able to rely on solar energy during a storm which resulted in loss of power to the electric grid? It is these types of stories that people can relate to and that can create lasting impact. We need more personal stories to sell sustainability. By Mindy S. Lubber, This article has been cross-posted from Ceres. With COP23 concluded and my Ceres colleagues home from Bonn, I’m grounded in a renewed affirmation of where we stand – as both Americans and as global citizens – and I’m more energized than ever to move faster and more boldly into the future. 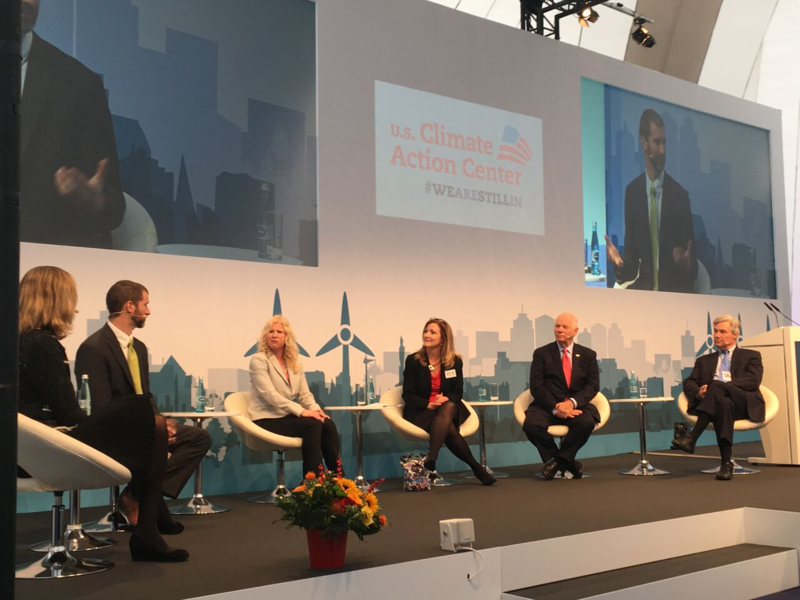 As Americans, we came to Bonn to deliver a message: We Are Still In. My colleagues, along with scores of U.S. business leaders, investors, governors, mayors and NGOs united at the U.S. Climate Action Center to share our commitment to the Paris Agreement. We delivered that message to a packed house every day, and our voices echoed out across the world. The U.S. 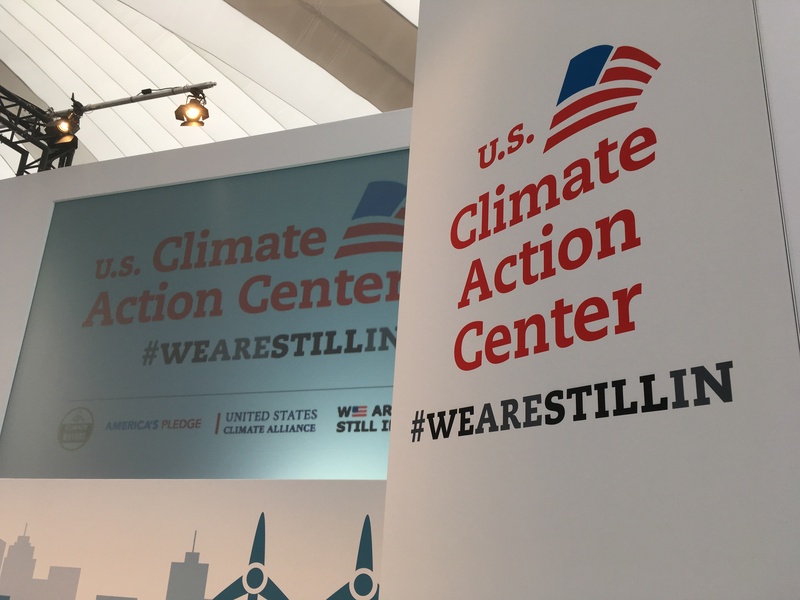 Climate Action Center generated more than 1000 articles in national and international news outlets, and #WeAreStillIn was a top trending topic on Twitter in both the U.S. and Germany. As global citizens, we came to assure our neighbors, our friends and our allies that the U.S. remains steadfast in our commitment to climate action – with or without the federal government. By participating in official U.N. panel discussions, roundtables and private meetings with world leaders, we emphasized that we are right by their side in the fight for a more sustainable, just and prosperous world. But while We Are Still In, we are anything but still. In fact, the U.S. business community is moving faster than ever. Major companies are making new, bold commitments and doubling down on the business case for sustainability. Institutional investors are ratcheting up engagement with companies and deploying more capital toward clean energy projects. Furthermore, cities and states across the country are transforming their economies and creating jobs by embracing the low-carbon transition. Joining Microsoft in Bonn were leaders from a wide array of industries. Mars, Incorporated, explained the economic reasoning behind their $1 billion sustainability pledge. Patagonia underlined the overwhelming business case for incorporating sustainability into their supply chain. Target and Walmart highlighted the importance of renewable energy procurement. And Fetzer Wines showcased their innovative carbon sequestration system – a practice that earned them one of this year’s Momentum for Change awards from the UNFCC. In addition, investors showed great determination to push us toward a sustainable world as well. On COP23’s Climate Finance Day, the world’s largest asset manager, BlackRock, declared that climate risk was one of their biggest priorities – underlining their role in helping a shareholder resolution on climate risk disclosure reach an astounding 62 percent majority vote at Exxon’s annual meeting. Finally, from virtually every investor or bank who joined us on stage or in a round-table, we heard about the unprecedented appetite for investment in green infrastructure, clean energy and energy efficiency – as well as the need for the public and private sectors to leverage each other to move markets toward low-carbon solutions. Abyd Karmali of Bank of America – who has pledged $125 billion in low-carbon business by 2025 – called on the public sector to use its capital to de-risk low-carbon opportunities in emerging markets. Val Smith of Citi – who has a $100 billion finance goal – and Erin Robert of J.P. Morgan Chase – who recently announced $200 billion in clean financing by 2025 – painted the picture of a “sustainability arms race” in which major banks compete to finance more and more clean energy and low-carbon projects. Mayor Bill Peduto highlighted how his city’s commitments to sustainability put the people of Pittsburgh back to work. Governor Terry McAuliffe emphasized how clean energy policies helped improve the livelihood of Virginians by attracting major employers. California Governor Jerry Brown explained how his state’s extended cap-and-trade program provides funding to protect those most vulnerable to the impacts of climate change. On top of all this action from U.S. leaders, 15 countries including the U.K., Mexico, Denmark and Ethiopia announced they were joining an alliance to phase out all coal by 2030, just days after President Trump’s administration held an event promoting the fossil fuel industry. This new development proves that world governments are in lock-step with the investors, businesses, U.S. cities and states, and the general public in their desire to accelerate the low-carbon transition. It’s clear that they are all still in and more committed than ever. As we get back down to business after Bonn, we know we need to work harder and smarter than we ever have before. We need to bend our emissions curve dramatically in the next three years. We need to bring more and more leaders into the fold. We need to stand firm in our commitments and message that We Are Still In. Because all of us – businesses, investors, NGOs, elected officials, concerned citizens – want to pass on a better world to our children. We want to be remembered as bold leaders who, when faced with a grave threat, did the hard work to ensure a healthy, prosperous and just world for generations to come.